Yes, it’s been about two and a half years since I returned from this trip, but you know what they say about better late than even later. Although this trip summary is long, it just barely skims the surface of what I did. While this piece runs about 4500 words, my full trip journal comes to over 13,000 words. If anyone wants all the fine details, I can post that too, as I’ve done for other trips I’ve taken. In October of 2005 I took off on Air India from Los Angeles to Frankfurt. Why Air India? It didn’t hurt that they were cheaper than everyone else, but the idea of flying Air India sounded more exciting than flying some boring American carrier. And the meals! I ate such delicious vegetarian food on those flights. I had no planned itinerary. 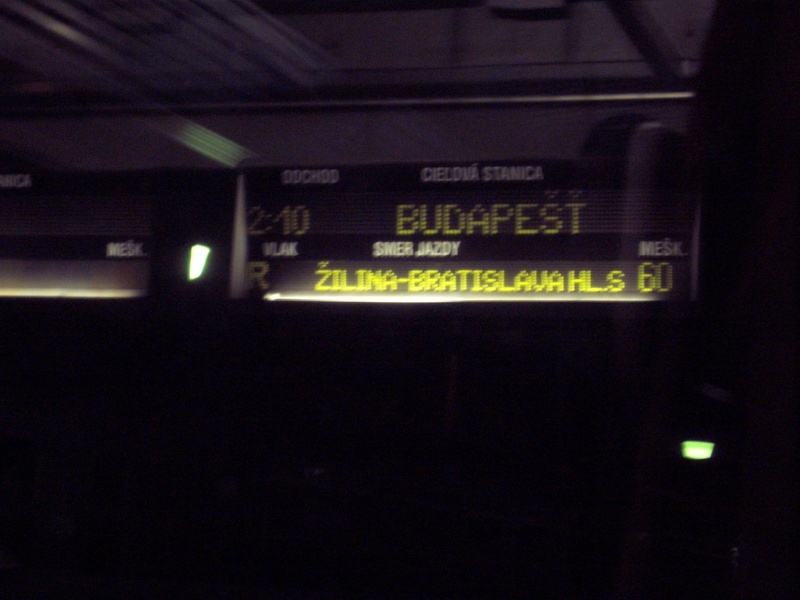 All I knew was that I would be flying out of Budapest seven weeks later, and would have to slowly wend my way there. I arrived at the Frankfurt airport, hopped a train for the main station, and then boarded a bus that would take me to the hostel I was staying at. I noticed that before it was time for the bus to take off, the driver was reading the Holy Qur’an. A sign of changing Europe. It’s funny how we travel to experience new things, but sometimes we gravitate back to doing the same things we do at home. I happened to notice that a Korean film series was being held, so I went to see “To A Starry Island” at the film museum. And a Japanese guy I met at the hostel told me he had just gone to a German soapland! After a few days of wandering the city while recovering from jet lag, including an interesting exhibit at the Modern Art museum made entirely of items bought on eBay, I began my U-shaped journey around the country. I took a fast ICE train (I realized later that unlike the Shinkansen, not all ICE trains are all that rapid) to Bonn, where the suburbs looked to me very much like 住宅地 in Japan), and then on to Köln, where a roommate of mine at the hostel, a guy from Taiwan who has lived in France since 1987 and would like to stay there, explained to me that his wife wants to move back to Taiwan but that’s because women’s brains are smaller and they therefore have only sixty percent of the intelligence of men. He offered up as proof that women have never made it past Level 6 in the game of Go. I have not independently verified any of this information, especially the size of his wife’s (or his!) brain. I find that most of my travel highlights involve interaction with locals, but making those connections can be difficult. We are often staying in tourist areas (this makes sense; would a tourist really want to stay in El Cajon (in San Diego) or Reseda (in Los Angeles)? ), don’t speak the local language, and our brief talks with the hotel desk clerk are likely to be the only time we speak with a native. Several months ago, I was on a trolley in San Diego, sitting next to two tourists from another state when one mentioned to the other that they had been in California for weeks and still hadn’t spoken to a local, so I did them a favor and started speaking to them, answering their questions and offering up some advice. And so it was in Germany. My first local experience was with an old friend who, while not a native German, has lived there married to a German for many years. 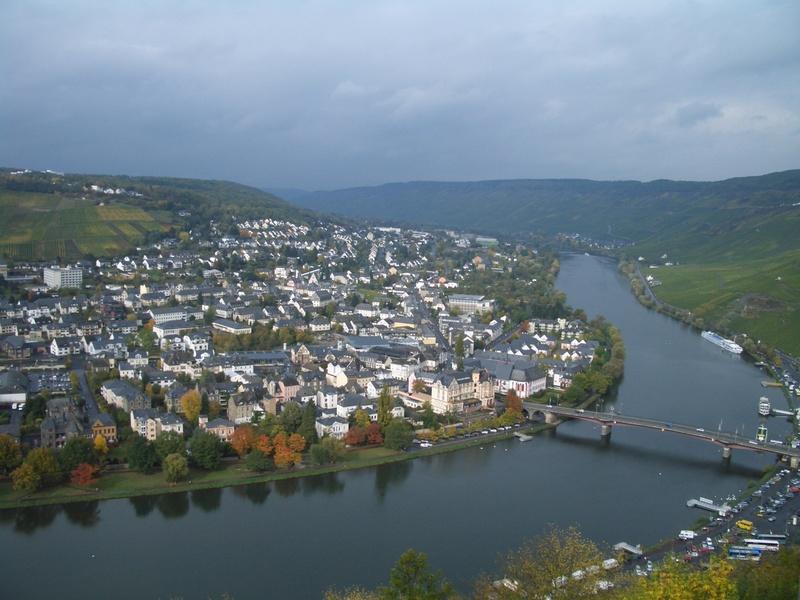 She lives in Bernkastel-Kues, a 700 year old town in the beautiful Moselle Valley, surrounded by vineyards. And sure enough, she and her husband are in the wine business. I got to try federweisser, new unfiltered wine, for the first time, and got a personal tour of all the neighboring small towns, complete with a rundown on each town’s current issues and gossip. On my way back up the valley, I stopped for one night at another river town, Cochem, before rejoining my main route and spending a night in Mainz. This was a Saturday night, and I got up early Sunday morning to attend services at the beautiful old Mainz Cathedral to experience it the way it was meant to be. Moving from Episcopalian to Jewish, I stopped briefly in Worms to check out an old synagogue and mikvah, dating back to 1330. The temple was heavily damaged in the war, but in 1961 the city restored it in an attempt to attract Jews back to the area. But aside from a few Russian Jews, who stayed for a few years before emigrating to Israel, the plan didn’t work. I was surprised to find a small shopping mall that was open on a Sunday, but when I walked in, all the shops were closed except for a gelato shop run by Italians. Then it was on to Heidelberg. When I walked into my room at the hostel, there were two French guys smoking pot. They asked if I minded and I told them just to keep the window open. When I later invited them to share the dinner I had bought in the hostel cafe, they told me they were surprised to meet a nice American. Our room overlooked the zoo and we could hear (and smell) the animals next door at all hours. It was next, in München (Munich) that I had the privilege of spending time with another local. I had just been eating some dried fruit and wanted something to counter that overly sweet feeling in my mouth. I wandered into the brand new Schrannenhalle shopping hall and ordered a green tea at a little tea & dessert counter. The woman next to me was eating a piece of cheesecake and I asked her if that was her dinner. Speaking of dinner, she started giving me suggestions on where to eat dinner before offering to take me to one of her favorite restaurants. In fact, it’s where she had her wedding reception. Her husband is a professional photographer and owns the studio roland schmid. She had ridden her bike to town, so she rode back to her neighborhood while I took the train, and we arrived about the same time and then walked over to Cafe-Bistro Stemmerhof, where we shared a fish with spaghetti and veggies (Zanderfillet), and a goat cheese on apple appetiser (Ziegenkäse Appel). Both were excellent. She also introduced me to a “radler”, half beer and half lemon-lime soda, and I ended up drinking these for the rest of my trip. (The British have this too and call it a “shandy”.) She grew up near the Czech border, but said that it was as if that other country didn’t exist. Now, she says the border area is full of Vietnamese selling various things. 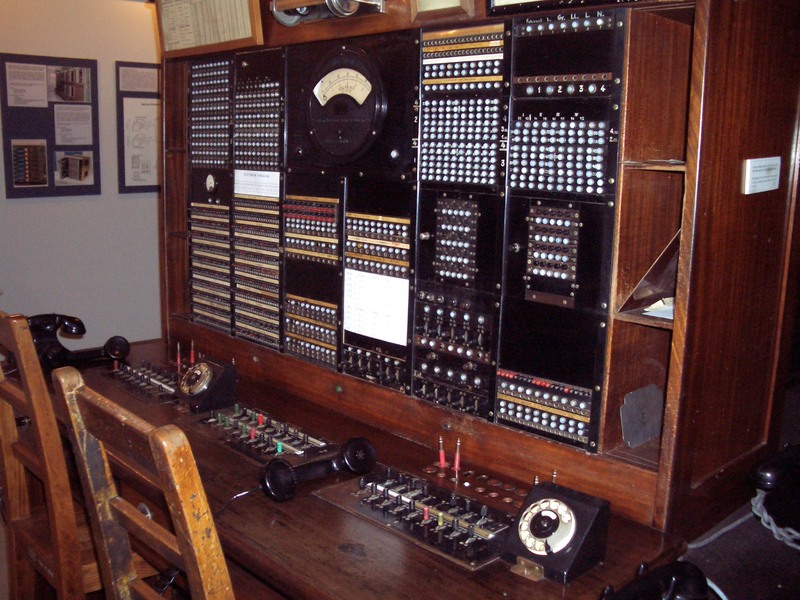 I seem to be good at meeting technophobes – perhaps it’s one of those “opposites attract” kind of things. This woman teaches yoga, doesn’t own a mobile phone, and hates computers, telling her friends that if they want to communicate with her they should call (but only when she’s at home, I guess 🙂 ). It was in Munich that I ate my first Chinese meal, and this became a staple of my trip, especially when I was in places where no one spoke English. I found I could always go to a Chinese restaurant and communicate well enough in 中国語 to get what I wanted. After five nights in Munich, it was time to move on, and I stopped for several hours in Bamberg, to wander the town and see the sights. On my walk back to the train station, I stopped at a doner kebab place and ordered an eggplant mousakaa. He started speaking English to me. He came here from Syria 43 years ago to study, but dropped out: “big mistake” he said. We talked about the word “doner”: he said it’s Turkish for sandwich but he needs to use that and other key words on his sign. He said no one here knows “schwarma”, the Arabic word for the vertical grill. He asked me how I know mousakaa, but said I know the Greek version with meat. His is Syrian and has only eggplant and tomatoes and such, plus cheese is added (I don’t think they use cheese in Syria). I asked him if he ever gets a vacation. He said when you have your own business, no. If he closed down for a few weeks he would lose too many customers. He said his was the first such shop in Bamberg, but now there are so many, mostly run by Turks. He said the government encourages them to come over because they need the labor. I asked about the meat he uses and he said his vertical grill meat is chicken, and that’s what most shops use. They used to use beef until the BSE scare. I said now people are scared of Avian Flu so he may have to switch again. He served me some arabic tea for free. I mentioned that there are so many of these shops around, and he said he thought it was like that in L.A. with this food too, but I told him that doner shops are not nearly as common in the U.S.
Again, one talk with a local is worth a thousand visits to old historical buildings. Finally, it was time to enter the former East Germany. My first taste was during a 45-minute layover in Leipzig. I threw my pack in a locker and walked around the market area, then over to the opera house where some fancy premiere was going on, then back to the station, through the mall in the station, and just barely caught my ICE. 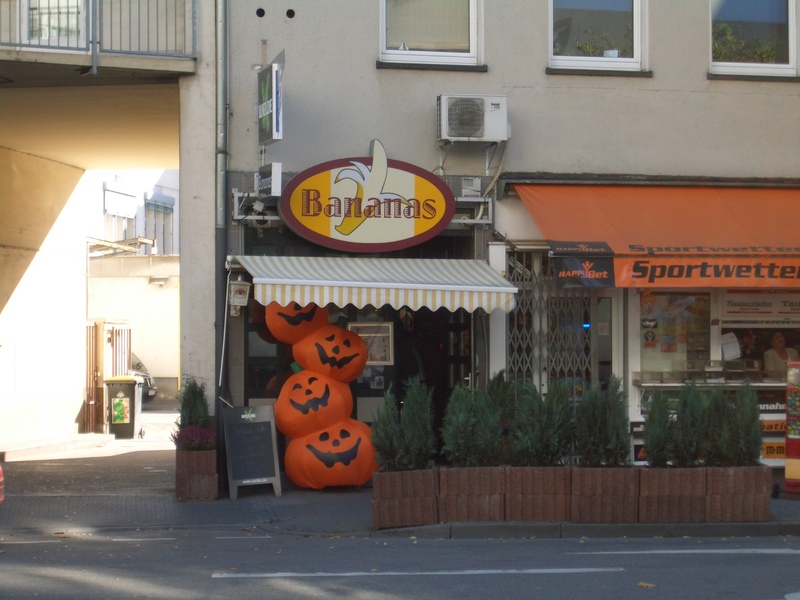 I arrived in Dresden, and the differences were immediately apparent. 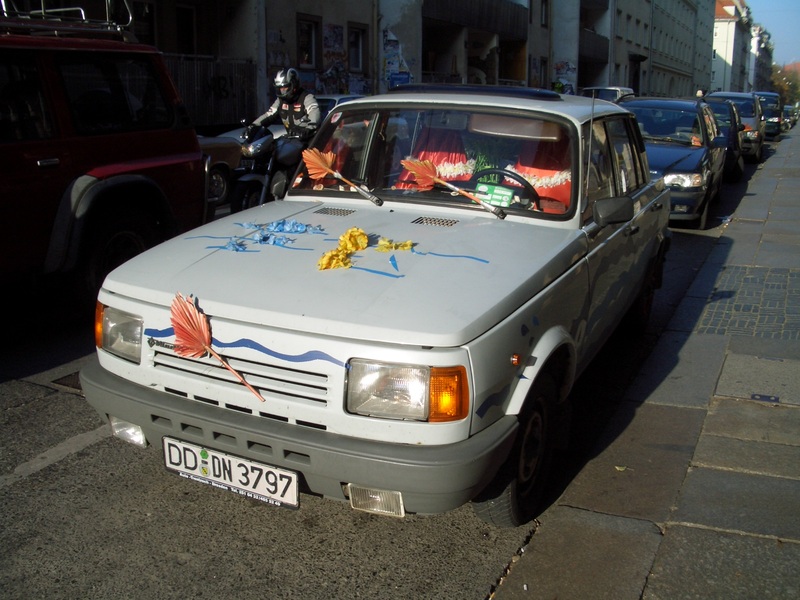 In contrast to the cities in the west that I had visited, Dresden was very quiet, especially considering that this was a Saturday night, and you still saw many old East German cars. I wandered deserted streets and found a restaurant specializing in goose, where I had some pretty good German roast pork with potatoes and cabbage (sorry, no goose). The next day was quite a treat. 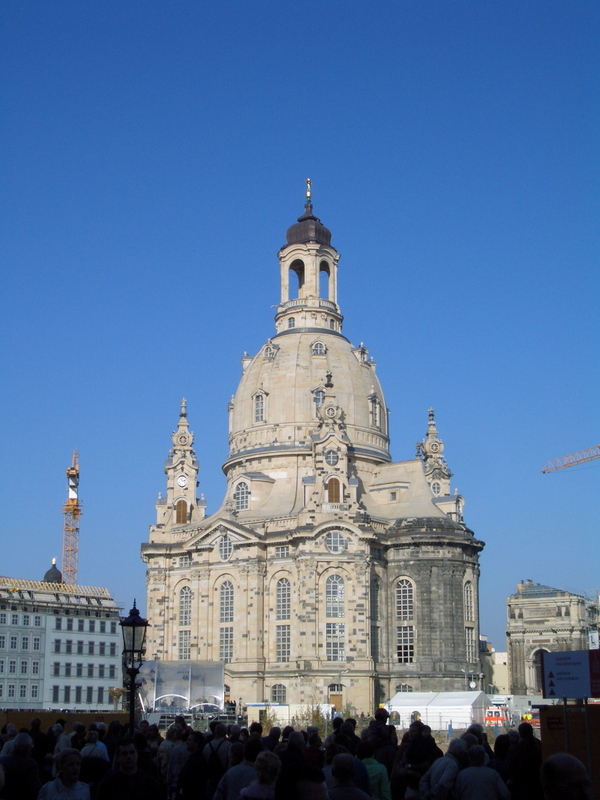 By sheer coincidence I had arrived just in time for the reconsecration of the Dresden Frauenkirche. This church (the city’s largest and most important) was destroyed (needlessly, many say) by the Allies at the end of World War II, and its bombed-out shell had sat there for over fifty years, until reconstruction began in 1993. Twelve years and €180 million later, it was finally finished, and the whole city was full of joy over this occasion, with many people weeping openly. Unfortunately, this great event also meant that I was unable to visit the inside of the structure, as the line to get in was three hours long, and once inside you were limited to ten minutes. Instead of spending half my day in line, I wandered the city and had yet another “local” encounter. I stopped in at a café for a Heisse Shokolade. The guys at the next table asked where I was from and when I said “California” they said “Let’s talk about George W. Bush.” I happily obliged, and found we were mostly on common ground. They said Americans don’t care about people in any other country and are barely aware of them. I had to agree, and we had a nice talk. This wouldn’t be the last time that strangers wanted to engage me in a discussion of American politics. Before leaving Dresden, I walked out to the far end of the train platform. A friend back in San Diego often monitors a web cam directed at this location, so I called him and told him to go to that web page and he’d be able to see me. Perhaps the precursor to justin.tv. 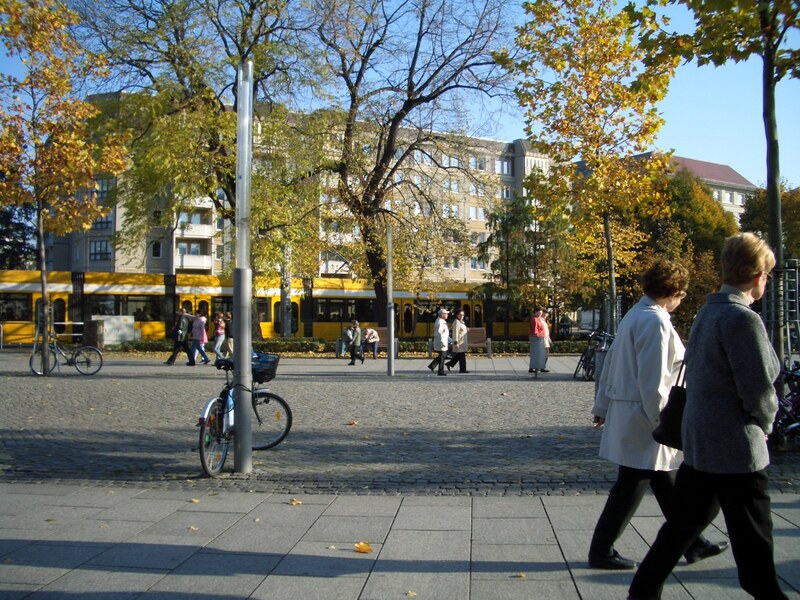 Then it was on to Berlin, where I spent my first full day on a nine-hour walking tour by Brewer’s Tours, conducted by Preston, an American German History major who had lived there for six years. This was a great introduction to the city, and after my mother arrived to join me a few days later, I spent several days retracing our steps and repeating to Mom the stories I had been told. I don’t have to tell you that Berlin has become (again?) one of the world’s hippest cities, and is full of places to see and things to do. 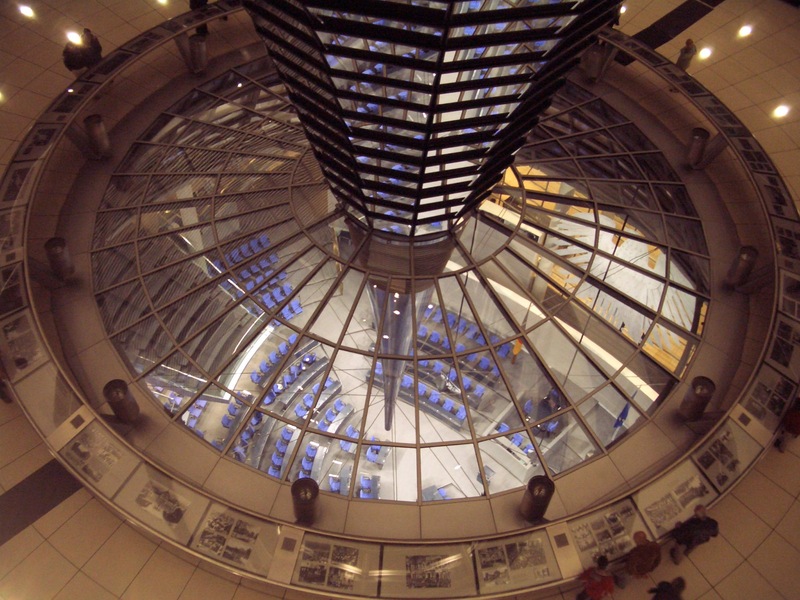 All through Germany I’d been impressed at the modern architecture I saw. Some places even looked to me like Japan. I liked the fact that Germans were willing to look forward, structurally speaking, unlike Americans, who tend to want to live in the past. If the 9/11 hijackers had succeeded in destroying the Capitol, do you really think it would have been rebuilt in steel and glass? On my all-day tour, I also met a species of Americans that I would run into over and over on this trip. The one-country-per-day tourists. These people come to Europe for a week and do a day each in places like London, Paris, Berlin, Vienna, and Budapest, often catching their sleep on overnight trains. This seemed odd to me. I guess it lets you say you’ve been there, but you don’t have time to see much more than the superficial. After showing Mom around Berlin, visiting Potsdam, and getting together with an old family friend, we took a train to Praha (Prague) in the Czech Republic. My mother and I did the typical tourist activities, and she was especially interested in trying some of Praha’s finer restaurants, especially after eating the slop that passes for daily fare. 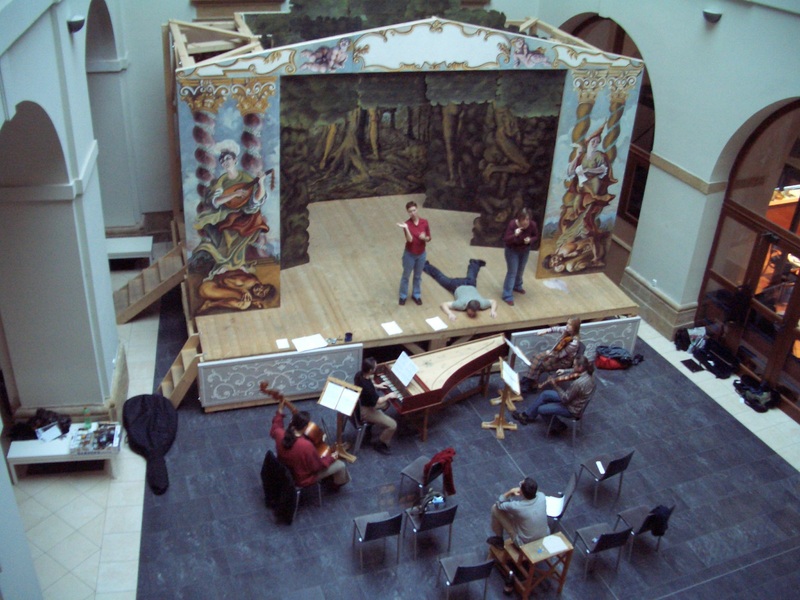 We also attended some of those too-short, overpriced, mediocre classical music concerts. I had thought I could survive this trip on the light sweater I brought along, but as we got closer to Winter and the temperature dropped, I found I needed more. We spotted a sign for a Carrefour, so we headed to a small shop near there and I picked up a winter jacket for USD$24. That, and the thermal longjohns I also found in Praha, kept me comfy for the rest of my journey. After five days, Mom went home and I took my backpack and went to find a hostel to stay in. 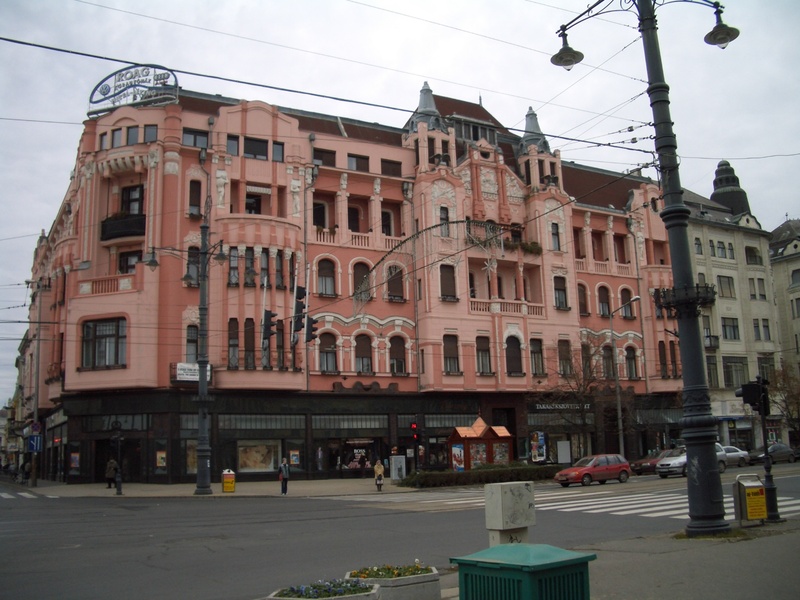 The first one I went to was Travelers Hostel, located near the old town square. While I was waiting to check in, I started reading the guest book on the counter, which was full of complaints about dirt and cold showers, so I quickly snuck away and called Sir Toby’s hostel, which, while a little out of the way, ended up being a great place to stay. Free from my mother’s reins, I began my usual urban exploration, including participation in events geared to locals rather than tourists. In that vane, I attended a jazz festival, Žižkov Meets Jazz, that cost only $4 and lasted for hours, and I had a lot more fun than when I sat for one of those 30-minute tourist rip-off shows. the only other city I visited in CZ was Olomouc. Olomouc is a university town in northeatern Czech Republic, and like most uni towns, had a good variety of fun and culture. I stayed at the Poets’ Corner Hostel, run by an Aussie couple who came several years ago and just never wanted to leave. While there I took in a modern folk music concert, with classical guitar, electric bass, and violin stick, which I enjoyed although I couldn’t understand any of the patter or lyrics. I also enjoyed a relaxing three hours in a Dobra Cajovna teahouse, where I used the opportunity to catch up on some reading, followed by an evening in a bar with a bunch of foreign students (mostly Japanese) studying Czech at the local university. I didn’t think I would visit Poland on this trip. Poland is quite a large country and it seemed best put off for another time. But I kept running in to other travelers who spoke highly of Krakow, and it wasn’t too far out of my way, so that’s where I headed next. As I learned to do on this trip, I checked hostelworld.com and booked a bed at the top-rated Mama’s Hostel, just a few steps from the main square, and a very friendly place. While there, I took a walking tour, and joined some fellow hostelers on a day trip to the salt mine. 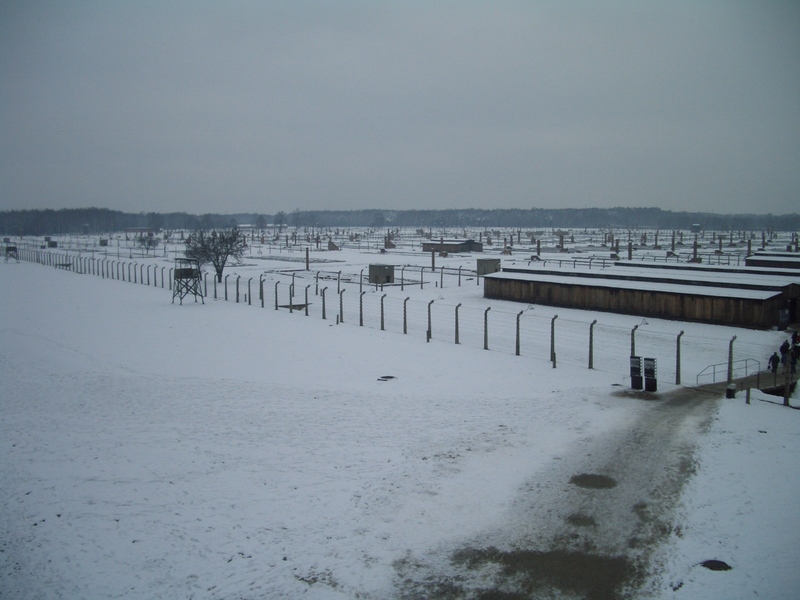 I also spent a day at the Auschwitz-Birkenau concentration camps. It was a very cold day, and the ground was covered in snow, adding to the eeriness of the place. Although I was a bit cold, I felt I had no right to complain, even to myself, when the prisoners (the ones who were not executed upon arrival) had to survive the cold with very little clothing. I enjoyed exploring the old Jewish neighborhood and reading up on the history of what happened here during the Nazi occupation. 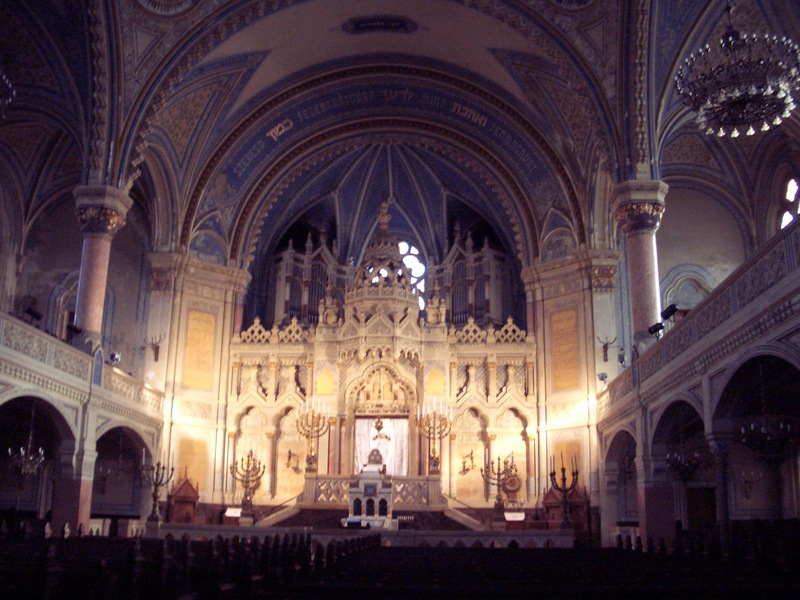 At one synagogue, I started talking with an Israeli from London. He asked if I’m traveling alone. I said yes and he said “You come here for happiness, but the sadness continues.” I tried explaining that I like being alone and not having to listen to what someone else wants to do, but he didn’t seem to comprehend this concept, and was convinced that I must be sad if I’m on the road alone. It was here that I ate my favorite perogie. I was hungry so I went looking for a cafe and came across a perogie restaurant where a little girl was picking up an order to take home to her family. This was a good sign, so I went in and ordered the smoked fish perogie and a tea. They had a choice of sauces including “Mexican” but I chose the traditional bacon and onion, and they were excellent. It was time to leave Poland, but my stay in the country was a little longer than I had planned. I had a tight train connection to make in Katowice (in retrospect, I should have taken the train the previous hour), which wasn’t a problem until we were sitting there on the tracks just outside the city for 15 minutes. That was just enough to cause me to miss my connection. I went to one of the ticket windows, where the woman informed me that the next train to Zilini in the Slovak Republic doesn’t leave until 22:56, in about seven hours. Seven hours??? She was apologetic, but what could she do. When life serves you milk, make a milk shake, right? So I took advantage of my situation and wandered the city until it got dark, at which time I found a large bookstore/café (Empik) and sat in there reading and drinking hot chocolate, followed by dinner at a bar, until it was time to collect my luggage and wait for my train. Not a bad seven hours at all. The train was late and, after most people got off at the following few stops, a bit scary. I was all alone in my compartment, now in the middle of the night, so I locked the door, opening it only to let in the immigration folks at the border. This run started in St. Petersburg and terminates in Budapest; I guess people on for the long haul (the trip is scheduled at 28 hours) must have been in a sleeping car somewhere (or maybe they flew). I finally arrived in Zilini, Slovakia at 03:45, and tried to find a place to stay. There was a hotel across from the station, but it appeared to be shut down. I finally relented and just hopped in a taxi and asked to be taken to the Hotel Slovakia, which was listed in my guidebook as the nicest place in town. As it was, I didn’t need to worry about spending much, because all they had left were old unrenovated rooms, which was fine by me. It was at this point that I decided to switch from trains to buses. I found that the trains in this part of the world tended to be old and rundown, and usually operated on the periphery of towns, so you never got to see the places you were passing through. Buses, on the other hand, were much more modern, ran more frequently, and actually drove through the center of the cities along the way. 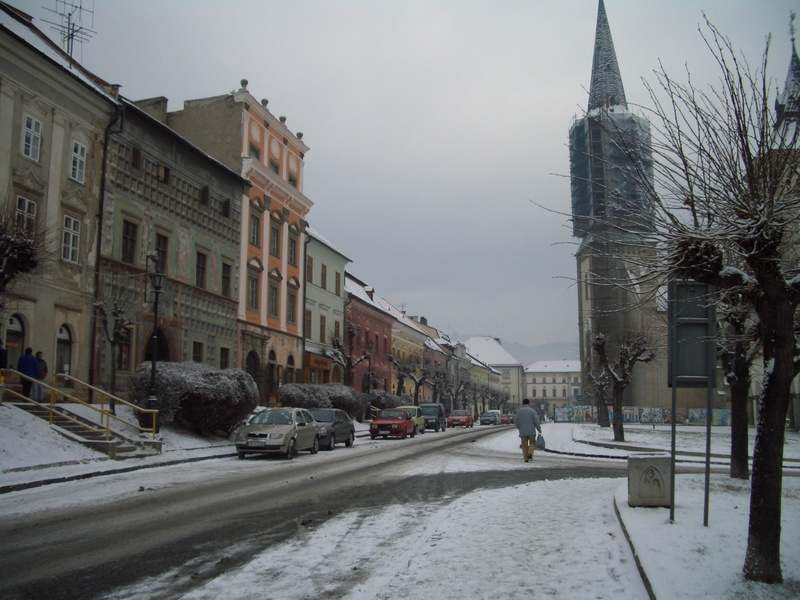 Not too many hours later, I woke up and hopped a series of buses to Levoca, via Poprad. We had a lunch break at a train station and I thought the driver said to me (by pointing to his watch) that we’ll leave in 20 minutes at 13:25. So I left my luggage on bus and went to the cafeteria there for some bad food. I was in the station lobby when I heard the sound of a bus engine, so I ran outside to see my bus about to turn out onto the highway. I ran fast and just barely made it back on the bus. The driver yelled at me. I can’t imagine what a hassle it would have been for him to leave with my luggage. Since that day, I’ve always been ultra careful at intermediate stops, especially when everything I own is on the bus or train. Levoca is a small mountain town and I spent a relaxing evening there reading in restaurants and cafes. 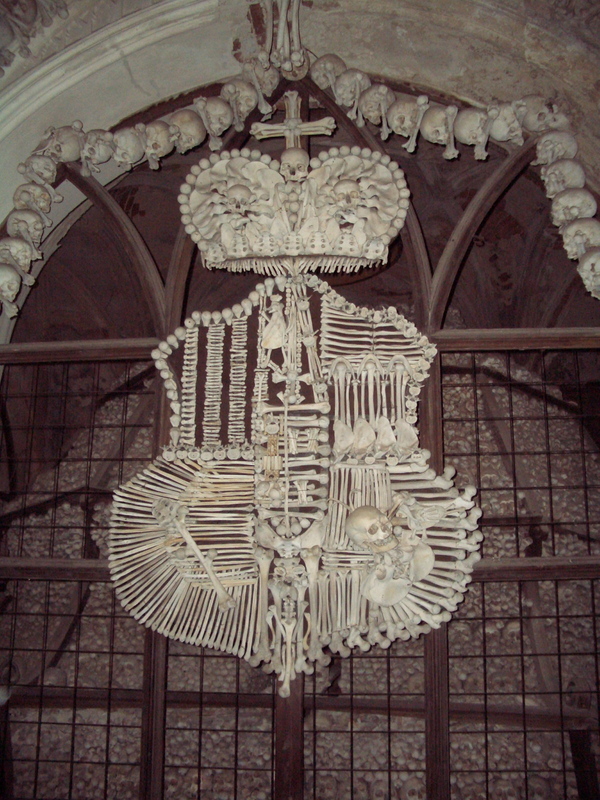 That was pretty much it for my time in Slovakia. 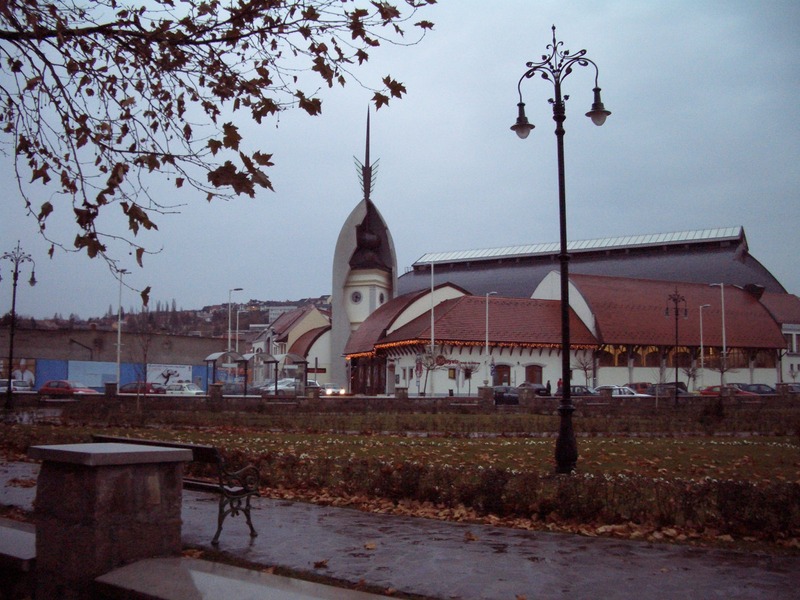 The next day I hopped to Kosice (where I considered stopping for a night, but it was raining), and then into Hungary to Miskolc. I had about an hour to wait there, so I went across the street to the modern shopping mall and grabbed some dinner. 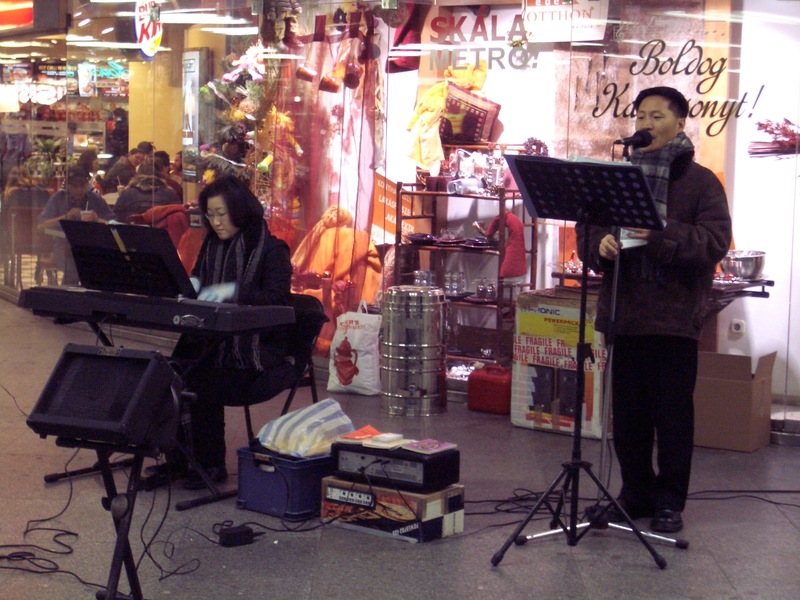 I also tried to procure a Hungarian SIM for my mobile phone, and approached both providers in the mall. One said “Our network is no good” and the other just said “no no no no no”. I still don’t know what the problem was. I ended up getting one from a third company, T-Mobile Hungary, the next day. I arrived in Eger that evening and spent a full day there, exploring both the town and the surrounding wine country, all on foot. At the time, a friend of my father’s had a son who was spending the year teaching English at a high school in the middle of nowhere in Hungary, in a town called Sarkad. That seemed like a good excuse to go visit, but he had to round up some bedding for me, as the town doesn’t even have a single hotel or pension. On the way there, I had a several hour layover in Debrecen, and walked into town for lunch, before heading back to the bus station. However, because it was Sunday, the only place open was our good friend Mickey D’s so that’s where I ate (hangs head in shame). Sarkad, in addition to not having a single place of lodging, has only one restaurant (but two Chinese goods shops), so that’s where we went for dinner. The next day, I talked to each of his classes and did my best to lead a discussion about my travels and California, and I even gave a primer on Chinese characters. I was impressed that he was working there for only USD$500 a month plus housing (nothing luxurious I assure you) and cable TV (but no Internet) and yet he gave free private lessons to any student who asked. He obviously wasn’t there for the money. 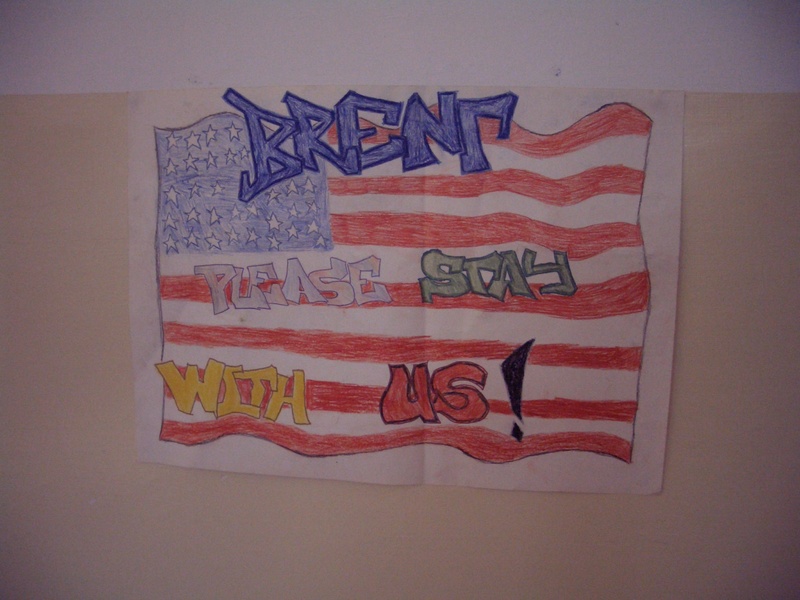 Brent, please stay with us! But I was free to leave, and so I did, taking my first train in a while to the county seat of Bekesava, where I spent my layover walking into town, eating a snack, and walking back to the train station, all while consulting with one of our programmers on the phone from San Diego. Then it was on to Szeged, complete with a casino flying an Israeli flag that promises an Israeli meal if you play roulette or buy a beer. I didn’t take them up on the offer, though the idea of an Israeli meal sounded good. 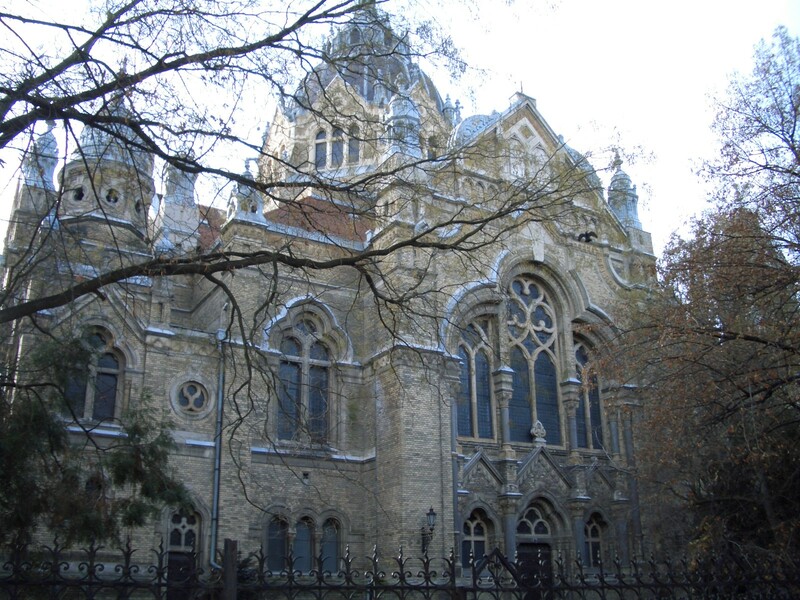 Szeged’s main attraction for me was a huge and ornate synagogue (the “New Synagogue”, built in 1903), with seating for 1300. Before the Holocaust, the city had about 8000 Jews. In order to get in to see the place, I had to track down the caretaker, who works at a nearby Jewish old age home. He said there were 300 to 400 Jews left. There are probably even fewer now. Budapest was probably my favorite city of the trip, despite the thermometer hovering around freezing. I spent a full week there, stayed in a great hostel, and attended lots of activities geared to locals. 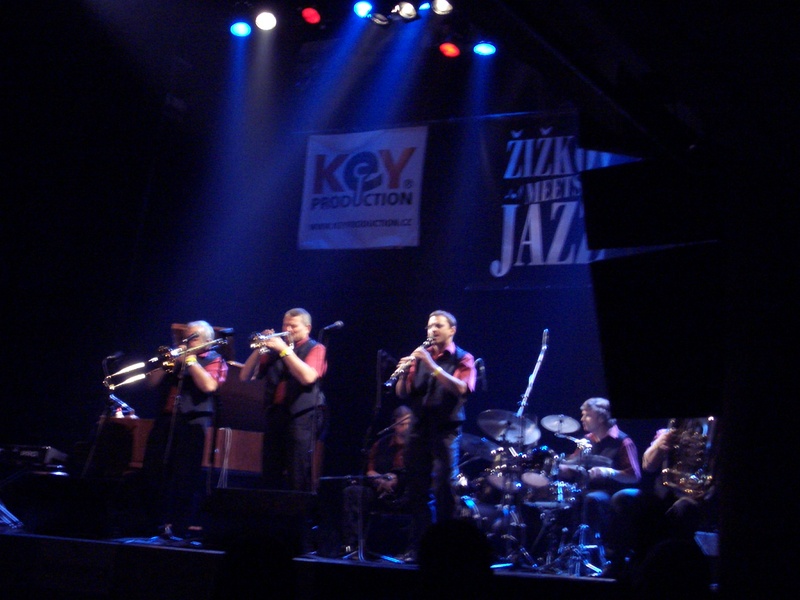 One night I went to a jazz concert, and the next night I went to a Klezmer concert. But it was more than a concert. After the first set, it turned into a dance, and everyone was encouraged to participate. Despite the fact that I’m Jewish, I had never been to such a show, and it felt like family to be hanging out with other Jews in a place one doesn’t think of as having a large Jewish community. In addition, if “White Men Can’t Dance”, then Jewish White Men can barely stand. 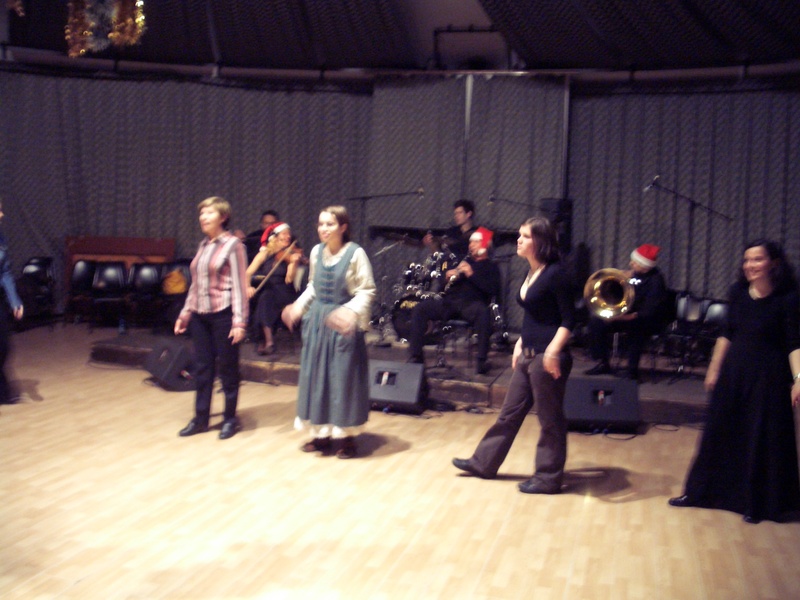 Therefore, Klezmer dancing is made to be so easy that even a total klutz like myself can do it. For an evening, I didn’t feel so incompetent on the dance floor. 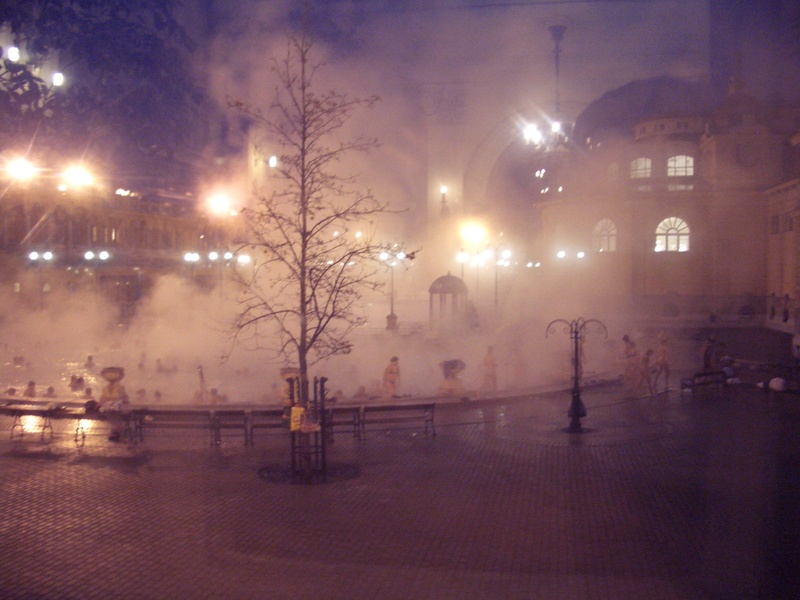 Another highlight of my time on the Danube was going to a public bathhouse. With the outside air so cold, it sure felt good to be sitting in ultra warm water. Inside, there were many different pools with water of varying temperatures and I tried most of these too. On my final night, I attended “The Bardroom”, a get-together for those speaking or studying English (mostly the latter). There were various readings of poetry and prose, and they held a contest where you are given a subject and you have ten minutes to write a short poem. The subject was “Hating Christmas”, which I should have been pretty good at, but my entry got just a few chuckles and little applause and so I ended up near the bottom of the pack, far below most of the non-native speakers. I guess it’s back to my day job for me. And speaking of going back to work, the next day I flew home, bringing to an end this great adventure.